Student leaders often fall into patterns of ineffectiveness because they simply don’t know how to communicate with their peers in a manner that invites respect. They whine or plead with their peers in a desperate attempt to get them to run back to their sets, remain quiet, arrive on time, or any number of other objectives. They may attempt to win them over through misplaced humor or by acting overly friendly. Consequently, the student leader is perceived as just another kid with no real authority. Fortunately, there are some very simple communication techniques that student leaders can use to help develop their expertise. · Have the student leader avoid the phrases, “Try to…”; “Make sure…”; and “See if you can…” These phrases weaken the delivery and often precede a comment that might best be stated more concisely. For example, rather than, “Try to keep your bell up,” simply state, “Keep your bell up.” “Make sure you lift your heels an inch,” becomes, “Lift your heels an inch.” “See if you can take a slightly larger step,” becomes “Take a slightly larger step.” Of course, tone of voice is critical, and student leaders may need to be coached on how they speak so they don’t sound bossy or overbearing. Leaders might reserve “Try to,” Make sure,” and “See if you can,” for the times when a skill they’re teaching is particularly challenging, unfamiliar, when the group is especially tired, or when they sense discouragement. 4. Most importantly, control stays with the person making the statement or asking question. 1. They’re based on feelings and opinions. 2. They invite thought, reflection, and contemplation. 3. They often take longer to answer. 4. Control shifts to the respondent. When addressing a group, an open question such as, “Do you want to try that again?” certainly shifts control away from the person asking the question (“Let’s do that again,” is much more effective). “Does everyone understand?” or “Does that make sense?” might work in a small group or one-on-one, but in a larger group it is ineffective. A better way of checking for understanding might be to say, “Raise your hand if you understand the instructions.” The delivery is stronger and control stays with the person making the statement. · Check that leaders use a confident tone of voice and a confident stance. They must speak in a voice strong enough for the person farthest away to hear instructions clearly. Have them make eye contact. It’s a powerful tool for effective communication. My experience tells me that it’s not enough simply to tell my leaders to make eye contact and speak confidently. These skills have to be practiced just like any other we teach. If we think back to those effective student leaders we’ve known, they weren’t afraid to make demands and hold their peers to high standards. They were able to bridge the gap between the students and the professional staff because they possessed the credibility of an adult while maintaining proximity to their peers. Chances are they possessed three critical attributes of effective leadership in music: they were strong performers, humble followers, and good communicators. Fortunately, all three of these can be developed “on the job,” which is where we all really learned to teach. Many of us have some sort of formal leadership training for our student leaders, but if we’re truly going to help them be effective, that training must be ongoing. Just like we constantly work on the fundamentals of playing and marching, the constant review of the fundamentals of leadership are every bit as essential to creating success for all our students. There is only one kind of discipline – SELF-DISCIPLINE! “Group Discipline” is nothing more than everyone in a group being self-disciplined together. You may share similar goals and values, but ultimately it is YOU taking charge of yourself to achieve those goals and live by those values. Postponing the things you would rather do in favor of the things that need to be done. This requires that you set priorities and decide what needs immediate action and what does not. Delayed gratification requires that you keep focused on the end result (your goal) and make choices that lead to that end regardless of whether you feel like it at the moment. Before a problem can be solved, you must accept responsibility for finding the solution. You don’t have to do everything by yourself. Get help when you need it, but see the problem through to its resolution. Even if the circumstance was brought upon by others or by something outside your immediate influence, OWN THE PROBLEM AND FIND THE SOLUTION. The more accurately you view yourself, the better equipped you are to deal appropriately with the world. The American Heritage Dictionary defines discipline as “training expected to produce a specific character or pattern of behavior.” How would you define character? The truth may be static or dynamic – it may change as circumstances change. Just as maps have to be updated to reflect the changing landscape, your personal MAP OF THE TRUTH will require revision from time to time. True discipline is never at the mercy of your emotions. In essence, discipline is a contract between you and your values. And like a contract, if you put your goals and values in writing, you’ll be more likely to honor the promise you make to yourself. Then share your goals with others. This will help keep you accountable for achieving them. For more insight into the notion of DISCIPLINE, I highly recommend the book, “The Road Less Traveled,” by M. Scott Peck. It’s great summer reading and may help launch you toward becoming the leader you dream of being. 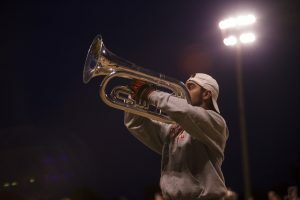 Marching and playing is a key element to marching band and drum corps. 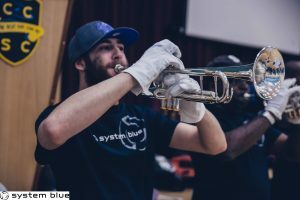 For brass and woodwind players, achieving the same musical level you do standing still while on the move is something that can take a long time to master. Here are a few thoughts to help achieve sounding as good on the move as you do standing still. • When you’re in music rehearsal, never forgot you will eventually be in visual rehearsal, and then again in ensemble putting everything together. So, when in music rehearsal, focus on separating your upper and lower bodies, so when you eventually add the drill (lower body), your upper body feels the same and you can achieve the same high level musicianship. When you’re in visual rehearsal, always BE a musician. Don’t hold your breath, constantly move your head, or allow the upper body to “sag”. The more you’re a musician when you’re in visual rehearsal, the easier it will be to put them together. • Remember to fill-up the instrument with air, LOTS of air. The more you can stabilize the instrument when on the move, the truer the sound will be. A general tendency is to lower the amounts of air when on the move, to “conserve” it due to the physical demand. Like a marathon runner, your endurance will GROW over time, so continue to push yourself. Before you know it, you will be able to handle the visual responsibilities while also playing with the same breath control you do while standing still. • Finally, r-e-l-a-x! The more tension you have throughout your body while on the move, the more difficulty you will have sounding great. Not only does tension prohibit you from creating the sounds you want, it hinders the muscle memory you’ve worked so hard on in music rehearsals when much more relaxed. Always be a musician, and always be an athlete. That way, when you have to put it all together, you will be a musical athlete! Something that continues to frustrate me as a teacher is the reluctance students often reveal when called upon to respond to a question or offer an opinion. I know they have answers, and as soon as they’re out of the room, there’ll be no shortage of opinions! There are times when I’ve asked a very simple question—one I know they can all answer, yet they sit in silence and stillness. Are the social pressures really that great? Have I done something to make them afraid to respond? Regardless of the reason, I refuse to accept this complacency, especially among the student leaders whom I count on to set the example. I want to instill in my students not just a culture of excellence, but a culture of commitment. This starts with something as simple as how they raise their hands. So, on that first day of summer band, we have hand-raising practice! With all the incoming freshman gathered with the upperclassmen, I say, “Upperclassmen, show our new members how we raise our hands around here.” Instantly, 200 hands shoot skyward, elbows extended as if reaching for some invisible prize. Then I say, “Now, everyone, show me how we raise our hands.” All the new members raise their hands just as enthusiastically along with the vets. Why? They’re just copying what the “big kids” do. Now, I’m working the social pressures in favor of that culture of commitment. “From now on, that’s how we raise our hands. All the way, or not at all.” Then I follow up with a few simply questions to which everyone can respond in the affirmative, and we’re practicing this simple skill. But how powerful it is in influencing that culture of commitment! Much is communicated nonverbally when people interact. Near the end of a long marching band rehearsal—when everyone is hot, tired, maybe frustrated—I might say, “Raise your hand if you’re working hard tonight.” If those hands are raised high and with enthusiasm, not only have we acknowledged as a group that we’re working hard, but we’ve shown enthusiasm for hard work. The WAY they raise their hands sends a powerful message. When we return to the previous set, an urgent “jog” or “hustle” back to the start communicates enthusiasm (whether they’re really enthusiastic or not!). When kids move slowly and lethargically, a much different message is sent, and these complacent behaviors can often contribute to a tedious rehearsal. Bystanders can be very influential because their non-involvement strengthens the prevailing attitude. When they choose not to respond, or they respond reluctantly, others can interpret this as disagreement, apathy, or even contempt. But when there are strong behavioral procedures in place, it mitigates the effects of fatigue, frustration, and even apathy. The behavior itself influences the mind and we redefine “fun” in the context of commitment! So we must beware the bystander because of his subtle but powerful influence. His lack of commitment allows others to see what they want to see to feel better about their own complacency. There is a wonderful Ted Talk that illustrates the power of body language in influencing attitude. The speaker is Amy Cuddy, and the talk is entitled, “Your body language shapes who you are.” Click here to see the video. If you’d like to delve more deeply into the subject of bystanders and their influence, I’d like to recommend a book entitled, “Followership,” by Dr. Barbara Kellerman. In her book she identifies five types of followers: Isolates, Bystanders, Participants, Activists, and Diehards, and she discusses how individuals move from one level to another. Fascinating reading for those of us leading so many! 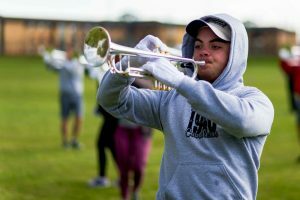 Drum corps is a remarkable activity. For those of us who have participated, we know how it connects us. We know the trials and tribulations as well as how hard we strive to make our dreams come true. With that in mind, we had to share the story of Joe Vise. Joe is from England and has previously marched with fellow System Blue endorsees, Kidsgrove Scouts Drum and Bugle Corps. This year, however, Joe took the leap of faith, crossed the pond and will march with The Concord Blue Devils B corps. Congratulations Joe! We love to see you keep it in the family, and we look forward to tracking your remarkable summer ahead. We wish Joe, Kidsgrove Scouts, The Blue Devils and all of our endorsees a successful and wonderful DCI season. Dreams really do come true.